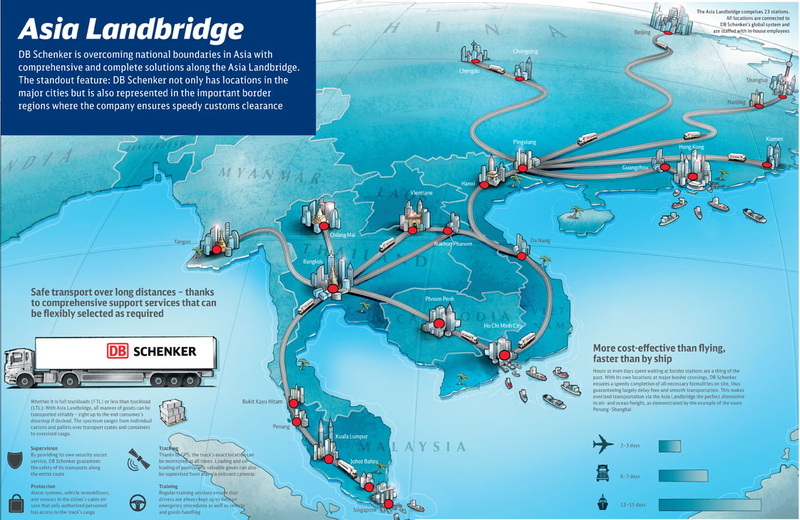 DB SCHENKERroad connects key ASEAN hubs to the rest of Asia. DB Schenker has launched an integrated Asia Pacific overland services – DB SCHENKERroad to offer customers and markets, a seamless suite of domestic and international over-land transport solutions. Having been in the Asia Pacific market for over half a century, DB Schenker’s regional network of domestic and cross-border transportation hubs have developed extensive connectivity and depth. The consolidation of intricate country networks into a collective architecture of logistics hubs managed under a unified platform and IT system, enables customers and businesses to leverage on various macro-economic and trade initiatives such as the ASEAN Economic Community, and China’s One-Belt-One-Road (OBOR). “With our international LANDbridge range of services, we are able to connect from Singapore, Malaysia, Thailand, Myanmar, Vietnam, Laos, Cambodia, all the way through to China. We are also making in-roads to increase the cross border connectivity with the Indian sub-continent. Furthermore, in every Asia Pacific country, our domestic inLAND range of services allow maximum reach for LTL (less than truckload), FTL (full truck load), parcel, and specialized requirements, through our link, direct, swift and select services respectively.”, says David Stenberg, Director, Transportation Services at DB Schenker in Asia Pacific. With a distinguished and exceptional pedigree in Rail solutions, DB Schenker was recently awarded Asia’s Best Rail Freight Provider at the recent AFLAS in June. Recognized as a pioneer in the development of multiple railway transportation services linking China to Europe, Central Asia, Russia and Mongolia since 2011, this service complements and reinforces the offerings of all the overland modes, and offers customers the most comprehensive and unsurpassed inter-modal transport combinations, including Air, Rail and Ocean. “We are obsessively growing and strengthening our network to better serve our customers. 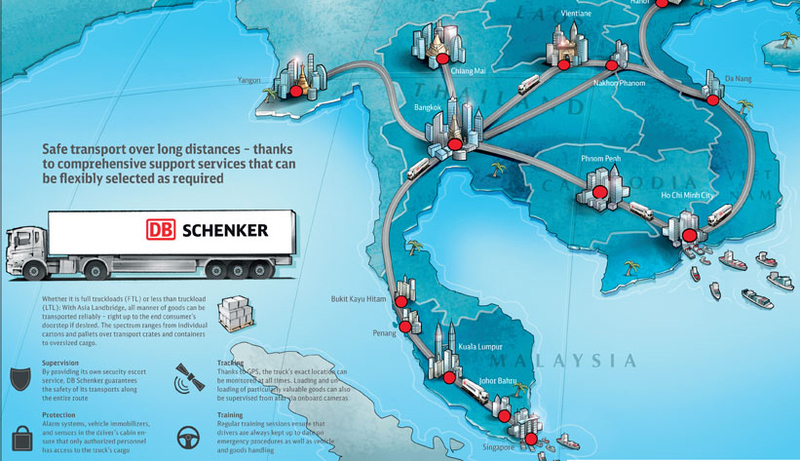 This over-arching umbrella of overland services makes it a very compelling and unique proposition for businesses to transform their supply chains in Asia Pacific,” says Norman Mummery, SVP Contract Logistics / Supply Chain Management for DB Schenker in Asia Pacific.